I saw this display in a Big W store here in Melbourne. 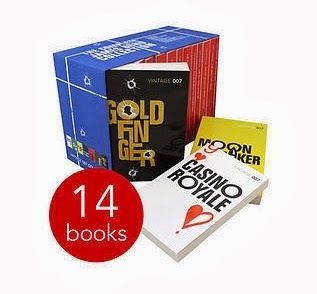 The set of 14 Fleming novels are also very reasonably priced. 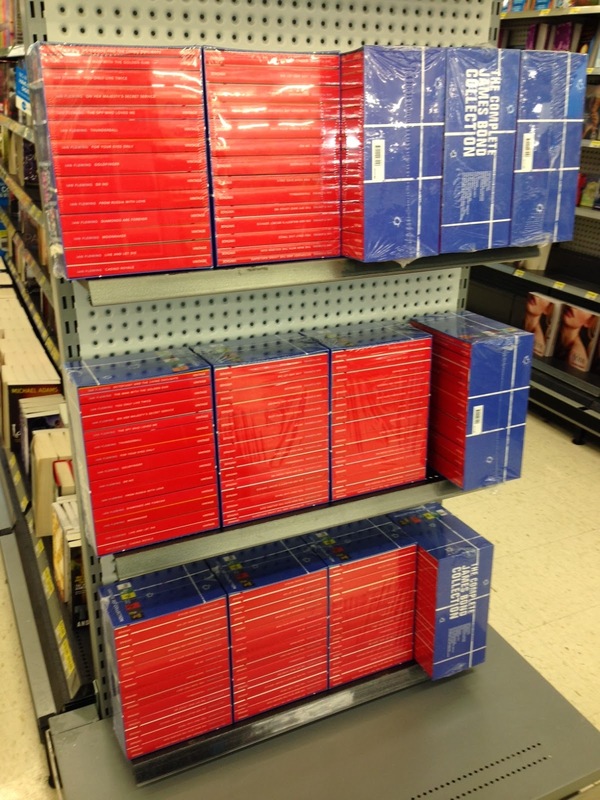 Despite having a price sticker of GBP £111.86 on its base the set is selling at Big W stores for AU $50 which at the current exchange rates is equivalent to US $44.31 or GBP £26.88. My wife and I visited a few Big W stores this morning before purchasing this set. The slipcase is sealed in plastic so I haven't had a chance to check if there are still barcodes on the back of the books however the paper stock used for the covers is definitely different to the same cover series already displayed on the PizGloria.com website. I'll be interested to see if there are any slight cover or colour variations, but regardless it's a great slipcase. On a different note yesterday I attended Day 3 of The Ashes match at the MCG between Australia and England. (We won convincingly today on Day 4). Anyway, my brother disappeared at lunch and returned with a meat pie and several of the postcards shown below advertising the "Designing 007" exhibition here in Melbourne. Never thought I'd be returning from the cricket with 007 collectables ! Thanks bro. About three weeks ago my wife and I stayed in the City for a "dirty weekend" as we had a fun run the next morning. After checking in our luggage at the hotel the first stop on our obligatory book hunt (before clothes shopping) was City Basement Books on Flinders Street. My wife stayed in the car while I walked/ran to the store. The two owners along with a family friend were sitting behind the counter and greeted me as soon as I entered the store. I made my way to the fiction section and quickly found the Bond paperbacks. As usual they had heaps of Bonds, and from memory there were a few new ones. After quickly scanning all the books available I spotted a White Pan Series copy of "For Your Eyes Only" in great condition and decided to buy another copy. I enjoy visiting this subterranean world. It has a really friendly and relaxing vibe under the City. Before I left I also asked if it was ok to take these photos. They said no probs. I explained about this blog and how I'm trying to promote second-hand book stores and they said "Yes, we're certainly a dying breed". That statement couldn't have been more ominous as I was about to embark on further book hunting in City, but at the time I just thought they were commenting on the general state of book stores around the world. After dumping our car in a car park, next stop was Fed Square where they have book stalls every Saturday selling second-hand. The Ripponlea Books stall had these three different cover variants of "Casino Royale" for sale. And these were other Bonds for sale at another stall whose name escapes me now (sorry). We then walked to Collins Street to visit Reader's Feast Booksellers. My wife always enjoys visiting this store which sells new books. It's really bright, staff are friendly and they have plenty of books. Kay Craddock Antiquarian Booksellers next door which was unfortunately closed as it was after 4pm. And a photo of the Regent Theatre opposite. As I've previously mentioned in this blog we saw this musical the following week. Bourke Street Mall with Christmas decorations. The Myer Christmas window display, not great photos unfortunately because of the reflection. An empty looking Swanston Street.